When Xu Shu uses an attack or hail of arrows, any player with the eight trigrams equipped cannot avoid the damage. 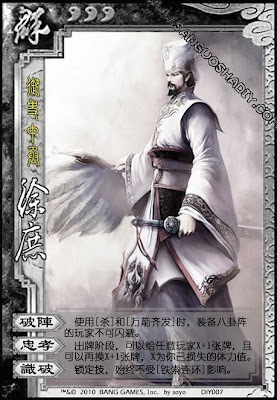 Xu Shu can give any player X+1 cards. He then draws X+1. X is the amount of blood he has lost. Xu Shu cannot be targeted by chains. If a player has the Eight Trigrams equipped, they cannot use it to get them an Escape. The attack is now unavoidable.